Google Fiber - a New Age of Internet ? Google Fiber – a New Age of Internet ? This is how I felt after watching the full hourlong Google Fiber announcement event on Youtube. Just as it left everyone present in the event flabbergasted, it made me feel the same. Google Fiber is a new internet service initiated by Google offering users upto 1 Gigabits per second of speed. Only the citizens of Kansas City, Kansas and Kansas City, Missouri will be receiving this awesome service for now. Google ran a survey around all the states wanting to know who were interested in having such a service at a lightning speed internet connection and out of the lot, Kansas city citizens were the most interested. I guess other states thought of having such high speed as useless. The event started with the Senior Vice President and Chief Financial Officer, Patrick Pichette discussing about the three fundamental process that determine the power of the internet. 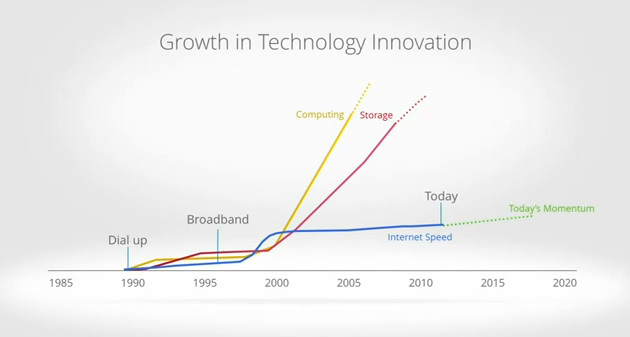 The first two factors show an ever increasing exponential curve but the ‘access to internet’ factor compared to the other two has not been increasing at a fast rate. It fails to achieve a steep increasing curve as the other two factors have achieved over the last two decades. In the US, average households receive about 2-5 Mbps in download speed and this according to Google is ‘slow’. At this very moment, I compared the whole situation with my country, Bangladesh where in the capital city Dhaka only a few can afford to have a 1 Mbps connection , let alone 5 Mbps. Google has therefore initiated this experimental project to see how it satisfies the customers and if everything goes well, no doubt other states will also be able to avail this service offering 100 times faster speed than the normal. A great presentation was shown by the product managers of google where they showed the Google Fiber in action. In a test between the Fiber connection and a typical one, it was seen that with Fiber, it was possible to download a large file with a speed of approximately 900 Mbps whereas the other capped at 5 Mbps. Sharing hundreds of high resolution photos and videos will become easier and faster, improving the engagement level with your loved ones. Just Internet Service? No, sir! Right after announcing Fiber, Fiber TV was announced where users would get the opportunity to experience a different level of watching TV using Fiber’s high bandwidth connectivity. Google promises to provide not only a high definition display, but the highest quality of High-Definition. With gigabits of bandwidth speed, it is possible to do more with the TV. It will provide more than 100 tv channels, all of which will be in HD and also the opportunity to record about 500 hours of video! 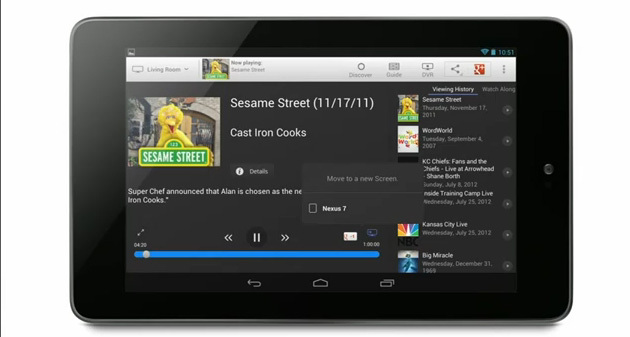 Moreover, the latest Nexus 7 tablet will act as one of the remote for the tv with the Fiber app installed in it. Gigabit + Google Fiber TV: This package comes with a 1 Gbps of download speed, hundreds of HD channels, 2TB of DVR storage for recording the shows that will be missed and also 1 TB of storage in Google Drive, TV box, storage box and a network box! Oh! Did I mention the point where they will be also getting the Nexus 7 tablet ? Lucky for the people of Kansas, the $300 construction fee will be waived and will only have to pay a monthly $120 fee. 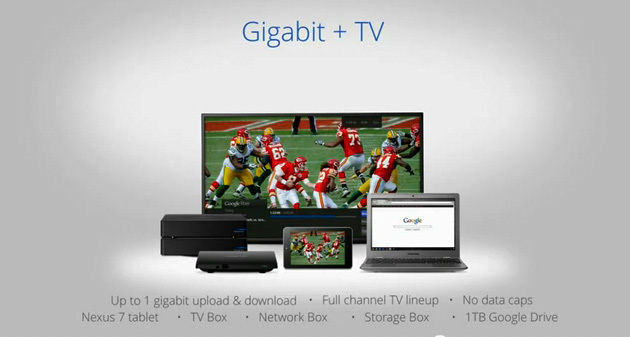 Gigabit Internet: Everything available here except the internet TV and the Google Nexus 7. 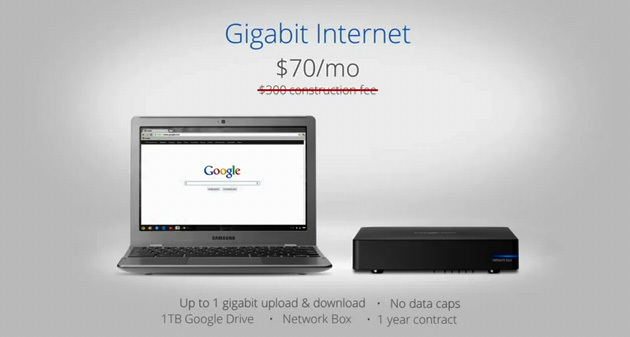 The Gigabit Internet will cost around $70/ month. 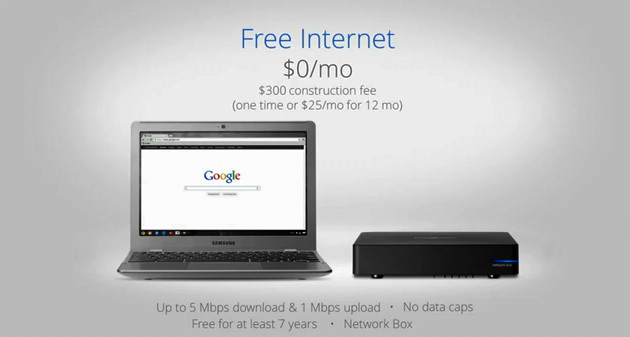 Free Internet: This is by far the most attractive package of all. With only the $300 construction fee, users would be able to browse for no monthly charge upto 7 years. Well, for this package, they would be receiving only 5 Mbps connection but hey its better than having nothing ! Setting up such a powerful network does take a lot of time as the infrastructure needs to be laid down in such a big city such as Kansas. If the response is positive, I am sure Google will look forward to setting up its Fiber network to other states as well. This looks like to be a beginning of a new revolution of internet speed. With Google starting this project, this is indeed a threat to the other ISP companies. Eventually, as the network grows, monthly fees will also go down attracting more customers. Google’s Fiber will hopefully pave the path to better connectivity and internet access to all. Is there ANY chance they’ll expand this service to other parts…say Asia for example? Wow! Google is really diving into several internet related market (unlike some “multibillion worth” social networking sites, not worth mentioning here). Makes me wonder, when will Google challenge Mcdonald’s head on? Lol. Great post man! Another great new product from Google. I cannot understand some of its future can you expand it well. Even the statistic chart is not quite clear. Thanks for sharing. Wow! This is the future for sure. I guess it has to start somewhere. Kansas though? Soon enough we will all be getting amazing speed like this though so very exciting. Thx!